Mark Meadows – climate policy champion? 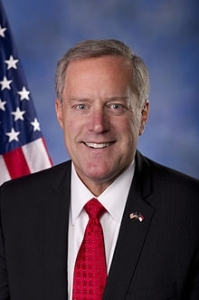 WASHINGTON — U.S. Rep. Mark Meadows, a North Carolina Republican and the chairman of the conservative House Freedom Caucus, suggested this week that he might be willing to support climate change legislation. During a House oversight hearing on Capitol Hill Tuesday, Meadows accused former Secretary of State and onetime Democratic presidential nominee John Kerry for politicizing climate change. But while he excoriated Kerry for his approach to the issue, Meadows mentioned that his staff was considering the merits of a carbon tax — a climate change policy that has long had bipartisan support. “Mr. Secretary, I am one of the few people here that … is more predisposed perhaps to your message than most on my side of the aisle,” Meadows told Kerry. That may come as a surprise to some, given Meadows’ past reluctance to back climate policies. Meadows has a 1 percent lifetime rating from the League of Conservation Voters, and scored zero percent in 2018. Meadows’ office did not respond to a request for comment about what sort of climate change policy he might be open to. Robin Bravender is the Washington Bureau Chief for the Newsroom network, of which Policy Watch is a member.